Lisa Breslow At Kathryn Markel Fine Arts, painter Lisa Breslow is currently exhibiting a dozen paintings of New York City. Breslow's panels, which favor atmosphere over specificity, are about the artist's genuine affection for the city she lives in and also represent a painterly exploration of the balance between representation and abstraction. They are intimate visions, to be appreciated slowly, that meditate on the situation of human beings in an urban environment. I recently asked Lisa a series of questions about her training, her work, and her artistic intentions. JS: Tell me something about your training and your influences. LB: My father was a portrait painter who encouraged me from childhood to become an artist, so I knew very early on that I wanted to pursue this. Growing up in suburban Long Island, the walls of our home were filled with artwork. His paintings came out of a humanist tradition, and Rembrandt was revered above all. I started out drawing and painting the figure, and continued to focus on this at the Art Students League, where I studied with Will Barnet, Isaac Sawyer, and others. Figures were central to my work until I visited Fire Island in my early 20s and fell in love with the landscape. It touched me in a profound way and pulled me in a whole new direction. I became a landscape painter. Over time, other major influences (short list) include Rothko, Avery, Morandi, Turner, Inness and the American Tonalists, 17th century Dutch landscape painters, Matisse, Porter, Diebenkorn. 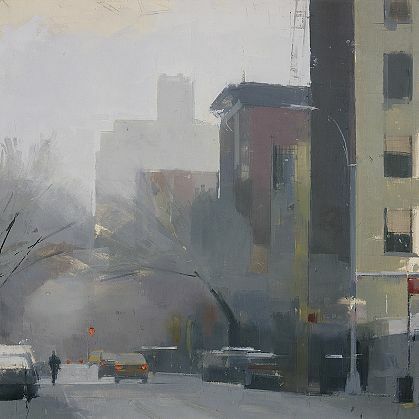 Lisa Breslow, West Village, Greenwich Street, 2012, Oil and pencil on panel, 24 x 24 inches JS: Over time your paintings have evolved from tonalist landscapes to more clearly defined urban scenes. Tell me something about how and why that change has taken place. LB: About 8 years ago, I was invited to participate in a gallery group show in which the theme was New York City. 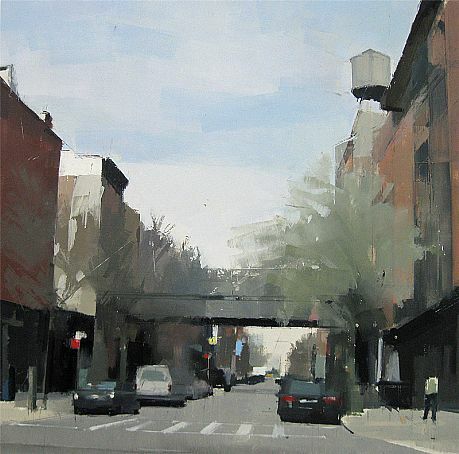 Although I had been living in the city my whole adult life, I had never painted an urban landscape. Central Park Lake provided a setting where I could combine natural landscape with geometric architecture. I was especially drawn to the reflections in the water at different times of day. It was a magical discovery for me: it was as if I were seeing it all for the first time. From that point on, the city became my subject. I subsequently ventured into painting actual street scenes, with their inherently more complex compositions and structures. As in my earlier landscapes, these are places which touch me in some way, evoking an emotional or psychological response. 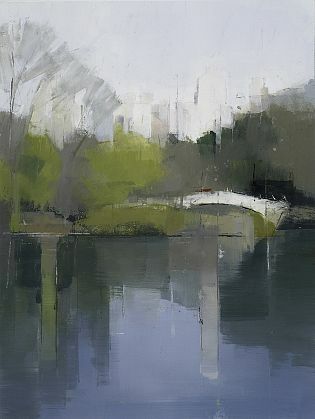 Lisa Breslow, Central Park Lake 2, 2012, Oil and pencil on panel, 16 x 12 inches JS: How do representation and a tendency towards abstraction find their balance in your work? LB: I'm always searching for the perfect balance between the two. In creating the urban scenes, my photographs enable me to capture a specific moment in time, and serve as studies. The painting that follows is very much about a real place and a real environment. It is equally about paring the subject down to its visual essence, a visceral, intuitive process of working and reworking the surface, and losing oneself in the paint. I constantly rotate the painting to free up my vision and open up fresh perspectives. When the painting speaks to me on both levels, I know it is complete. 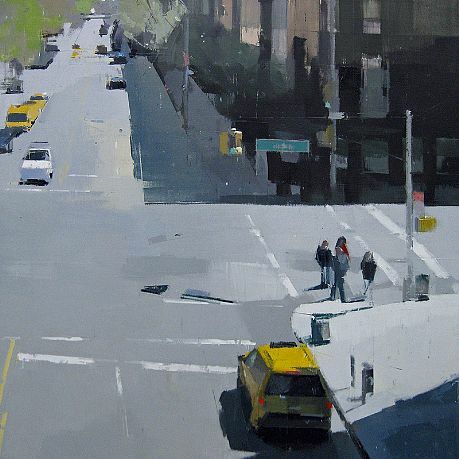 Lisa Breslow, From the High Line, 2012, Oil and pencil on panel, 24 x 24 inches JS: Do you have strong feelings about New York City that infuse your depictions of it? 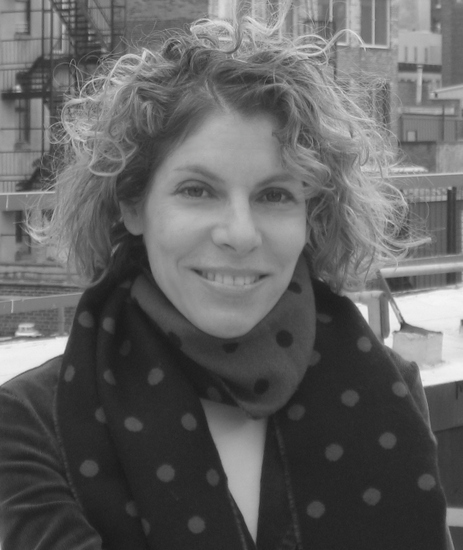 LB: Since I began painting Central Park, my experience and appreciation of the city has deepened. Many of my new paintings depict places from my day-to-day life, street scenes or locales that I walk past at different times, and in varying light. The beauty is there to see, in the reflections which animate a deserted street in Long Island City, or trees making a graceful arch over a West Village street on a snowy day. Once in the habit of seeking out natural beauty in places far from the urban jungle, I now have a world of possibilities at my doorstep. I feel a stronger affinity with people I encounter in the city, and more connected to humanity as a whole. 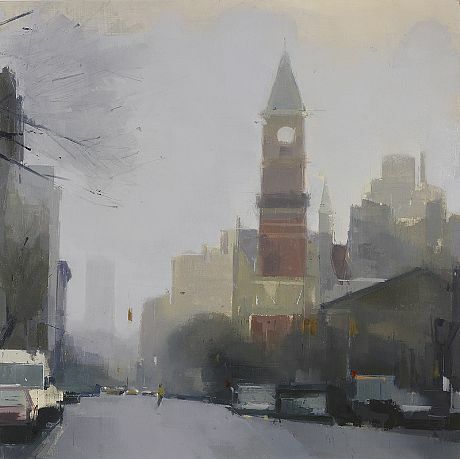 Lisa Breslow, Jefferson Market Library, 2012, Oil and pencil on panel, 24 x 24 inches JS: How important are sensations of temperature and weather in your work? LB: They are ever-present. One of the great things about NY is the changing seasons, and how each is such a unique visual experience. 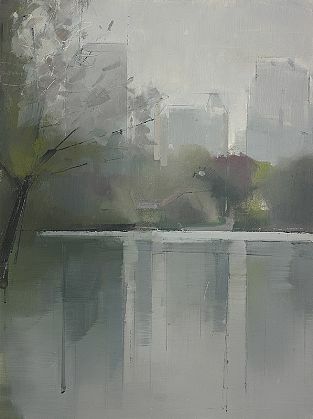 Lisa Breslow, Central Park Lake 3, 2012, Oil and pencil on panel, 16 x 12 inches JS: Figures play a very minor role in your recent paintings. Do you think that might change in the future? LB: The figures are incidental in one way, but also significant. Like street signs, they play a role as abstract compositional elements, but for me they can represent something else as well. They are observers and participants within the painting whom I, as the viewer, can identify with. Lisa Breslow, High Line, 2012, Oil and pencil on panel, 24 x 24 inches JS: As you look over your current exhibition at Kathryn Markel Fine Arts how do you feel about your own work? LB: I look at this exhibition, and feel excited. It all comes back to your earlier question about balancing representation and abstraction. It's an ever-constant challenge, and I met that to some extent, while still expressing my love for NYC.